War and Peace (1869) - Many consider War and Peace to be the greatest novel ever written. 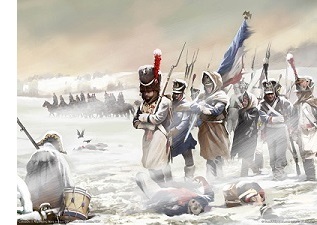 The story is set during the reign of Napoleon Bonaparte (and Tsar Alexander I), and culminates with the French invasion of Russia in 1812. So indelible was the event and so profound on the psyche of the Russian people that it inspired Leo Tolstoy to produce an epic tale of the period (written from the perspective of the Russian aristocracy). It is also an early example of historical fiction; that is, a fictional story set within a historical context. As a veteran of the Crimean War, Tolstoy had a realistic grasp on how war is conducted which is evident in War and Peace. And he was meticulous in his research of the period on which he wrote. At over 1,400 pages, it is also one of the longest novels ever written (seventh longest in a Western language by modern estimates). Most of it is written in Russian, but parts are in French. Tolstoy inserted a lot of his own philosophical beliefs on the nature of war throughout the story; and therefore, did not consider it to be a true novel, but more of a novel/essay. Although it is one of the best selling books of all-time, it does not rank near the very top; most likely due to its length, as well as the fact that it has not been translated into as many languages as most of the other classic works of literature. Parts of it made its way into a Russian periodical between 1865 and 1867, but it was published in full in 1869.